I love being able to play co-op video games with my fiancee so when we bought ourselves a Nintendo Switch, we knew that we needed to get a second controller as soon as possible. But we just shelled out a lot of money to cover the cost of the unit itself plus several video games and a 200 GB micro SD card, so we wanted to avoid buying the pricey official Nintendo Switch Pro Controller if we could. That led me to 8Bitdo’s SF30 Pro Controller – a bluetooth wireless controller that’s compatible with different devices, including the Nintendo Switch. With that said, my review of the SF30 Pro is strictly based on it’s performance as a Switch controller. By the way, I also reviewed 8Bitdo’s FC30 Pro Controller here – if you’re interested in the SF30, you might be interested in the FC30 as well so check that review out too! 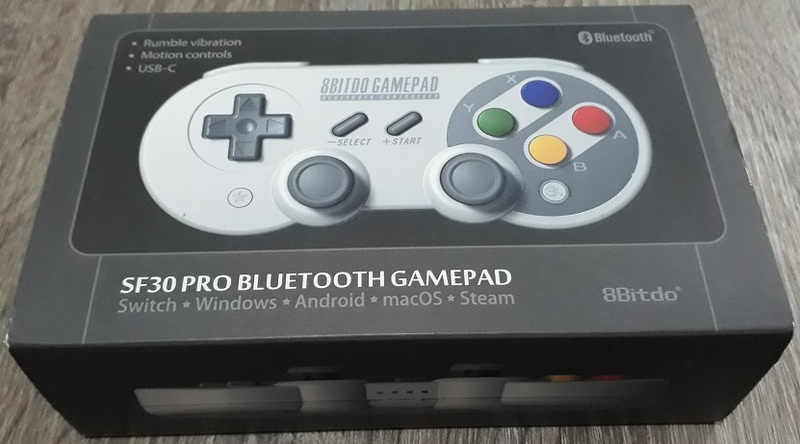 Box for 8Bitdo’s SF30 Pro controller. The first thing about the SF30 Pro that caught my eye is it’s design, which is based on the Super Famicom controller. And you know what? The thing not only looks quite similar to Nintendo’s classic controller, it also feels like you’re holding the real thing and that is a big plus for me because I love the 16-bit generation of video games. It actually feels better, in fact – the SF30 Pro is a little thicker especially near the shoulder buttons and feels a little heavier, in a good way. 8Bitdo did such a good job in replicating the original design that the face buttons of the SF30 Pro follows the same color scheme. In terms of buttons, the SF30 Pro has everything that a Switch Pro Controller has: four face buttons in the same layout, a D-Pad, two clickable analog joysticks, a pair of shoulder buttons on each side, a sync button, a Screenshot button and a Home button. Almost everything is in places where you’d expect them to be as well: shoulder buttons are on top of each other instead of being beside each other (see FC30 Pro), the Home button is on the right side of the controller and the Screenshot button is on the left. Only the D-Pad and left analog stick are switched up but this isn’t an issue at all; because the SF30 doesn’t have grips, it’s easy to adjust how you’re holding the controller to make either one accessible. Playstation fans may even prefer this layout compared to the X-Box/Nintendo approach, with the left analog stick swapped with the D-Pad. Front view of the SF30 Pro. All the basic components of the SF30 Pro functions really well. The excellent D-Pad feels like it was made by Nintendo themselves. All the face buttons are clicky and responsive, and the Home and Screenshot buttons are embedded in such a way that it’s hard to accidentally press them while using the SF30 Pro. What stands out amongst these are the shoulder buttons – 8Bitdo had to fit two shoulder buttons on each side in such a small space and their approach really worked well for me, with a thin and slightly raised button serving as a bumper and a flat, wide, contoured button that works as a trigger. View of the SF30 Pro’s shoulder buttons. I love how 8Bitdo managed to fit them in such a small controller. What really impressed me is how the SF30 Pro can do almost everything that a Switch Pro Controller can. Aside from having all of the same buttons, the SF30 Pro also has rumble features and gyro controls. The rumble isn’t has good as Nintendo’s HD Rumble and when the SF30 Pro was first released, it was quite loud and was too strong, but this has been addressed with firmware updates and when I got the controller, I did not have any issues with this feature. As for the gyro/motion controls, it works well enough that you can use the SF30 Pro on games that require the use of motion controls (such as Splatoon 2). And the SF30 Pro even has the four LEDs that indicate which player the controller is assigned to. 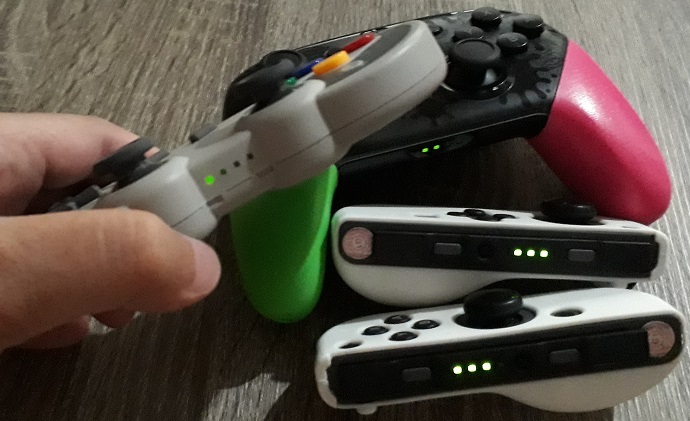 I don’t have enough controllers to see if the LEDs are able to correctly identify player assignments for anything beyond four player controls (official Switch controllers can), but for four players the LEDs work accurately. I think that this aspect is a little underrated but is very important if you often play with three or more players and are using unofficial controllers for your Switch. 8Bitdo even covered a small detail like having matching LED indicators, making it easy to identify which player the SF30 is assigned to. Since I’m reviewing the SF30 Pro as a Switch controller, it is important to ask what can’t it do that official Switch controllers can. And this list is very short! The SF30 Pro doesn’t have an IR camera (a feature that as of this writing has been rarely utilized) nor an NFC reader (which you won’t need on multiple controllers – you can use the right Joycon if you need amiibos). I’m not sure if the Switch’s battery life feature works with the SF30; from my experience the Switch always shows a full battery meter for the SF30. The SF30 Pro’s Home button also can’t “wake” the Switch up from Sleep Mode – a feature that’s not really necessary but would have been great to have especially if you keep the Switch docked often (I don’t; I take it out of the dock after use and keep it in a protective case). The SF30 Pro also doesn’t pair as quickly with the Switch as official controllers do, and sometimes you will need to restart the Switch to be able to pair the devices successfully. The pairing delay is noticeable, but not to the point that it becomes an annoyance. Finally, the SF30 is not as comfortable as a Switch Pro Controller – the official controller feels so good to hold! I can’t really take this against 8Bitdo though, as the SF30 Pro was based on a controller that wasn’t designed with ergonomics in mind unlike today’s controllers. When switching from a Pro Controller to the SF30 Pro, you can really feel the absence of the grips of the original. Depending on the situation, this can work as a plus for the SF30 Pro. Because it is not as bulky as modern controllers, the SF30 Pro for me is a better option when you’re travelling. I keep mine in a small plastic food container whenever I bring my Nintendo Switch along with me. I love 8Bitdo’s SF30 Pro Controller. It’s not as good as Nintendo’s official Pro Controller, but if you look at it from a pricing perspective the trade-off is more than fair: I was able to purchase my SF30 Pro Controller for approximately $47, which is roughly $23 cheaper than the official Switch Pro Controller. That’s enough to buy some of the smaller Switch eShop titles available! And you’re really only losing HD Rumble, the IR Camera, the NFC Reader, and a few nice-to-have quality of life features. The SF30 Pro Controller has/can do everything else that you can get/are able to do with Nintendo’s Pro Controller, plus it is way more portable. Nintendo’s official Pro Controller is still the best Switch controller available, but 8Bitdo’s SF30 Pro is a viable alternative. I highly recommend the SF30 Pro to anyone who doesn’t want to spend $70 on a Switch controller, as a second/third/fourth controller for families who need more than one controller for multiplayer, or for those who travel a lot but still want to play the Switch in docked mode. Even if we now own one official Pro Controller, I still primarily use the SF30 when playing games in docked mode on the Switch.